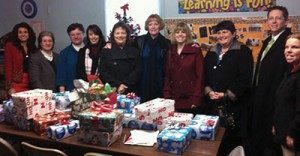 The O’Donnell Law Offices team has made a generous donation to the children of the McGlynn Learning Center in Wilkes-Barre, PA. This is the 6th consecutive year of participation for O’Donnell Law. The O’Donnell team donated 25 pairs of sneakers that will improve the lives of the McGlynn children.